Lizzie playing with her new Knot So Soft Bunny toy in Lynchburg, Virginia, on 11/29/2008. Video taken with my mobile phone. 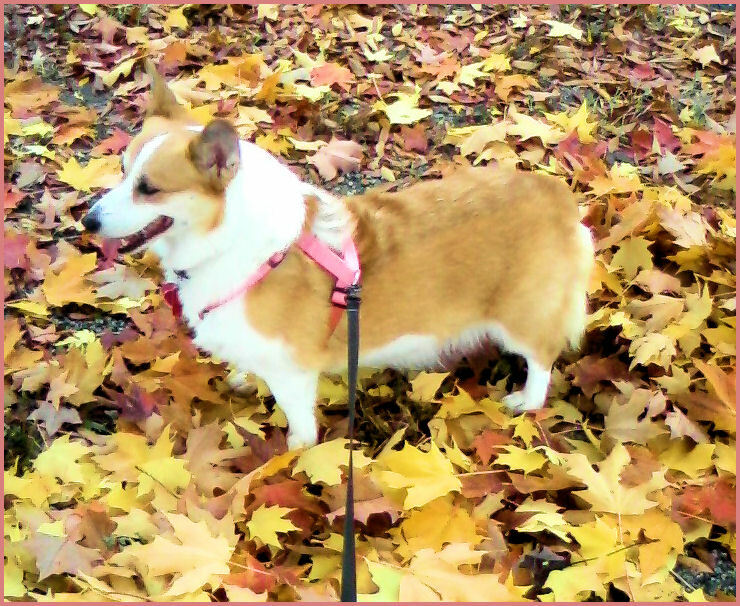 My darling girl and I are both enjoying the cool autumn weather. Although the gusts (and accompanying noises) frighten her, she's not letting them take all the enjoyment out of our walks. 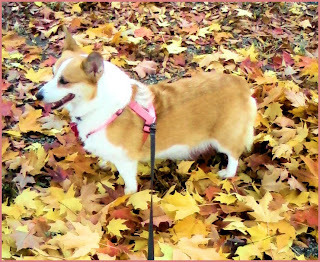 Besides, on a completely irrelevant note, I think she looks so pretty amongst the lovely leaves! She's experiencing some itchiness, probably having to do with seasonal allergens. However, she isn't letting the occasional chewing and scratching keep her from her perpetual napping. She is really good at napping! I gave her a bath last week, with hypoallergenic dog shampoo, and for which she was very well behaved. The poor thing will have to be subjected to another this month, but not until I get some more shampoo. I am constantly surprised by the extremes of Lizzie's nature. On one hand she is the epitome of a spud puppy-- relaxed, quiet, and reclining for 22 hours a day (maybe a slight exaggeration.) On the other hand she turns into a trembling mass of nerves over some unfamiliar inanimate object left out where she feels it ought not to be. OH NO! She's developed one little behavior that we all find endearing. It takes place when she and I are on the sofa. If something frightens her she will slink over to me, turn around, and then slide her little Corgi behind off of her blanket until she's securely attached to my hip. Exactly like she did just now when the wind whistled through the front door! Perfect timing, eh? Using the Peticure Safe Guard/Dremel Rotary Tool is a dream! What a wonderfully clever and efficient system. As far as I'm concerned, it beats the heck out of every other nail groming tool out there. I am duly impressed and Lizzie isn't traumatized. w00t!